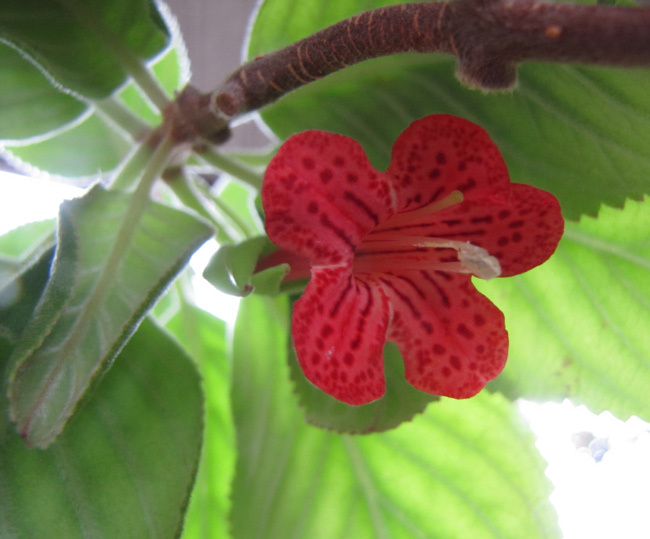 I came home from Gesneriad Society convention in Rochester, New York, to find two flowers open on my plant. This picture was taken the next day, 11 July 2006. The plant was grown from seed sown in early 2003. This picture shows the distinctive reddish-brown stem, which helps to distinguish it from the related Vanhouttea calcarata when not in bloom. The new species V. brueggeri was described by Alain Chautems in a 2002 paper. It grows in Minas Gerais state of Brazil, near the border with Rio de Janeiro state, at an altitude of 1400-1600 m (ca. 5000 feet). Some plants "were observed growing in pure quartzite sand" (Chautems). This plant took three years to bloom from seed, but it is likely I could have gotten it to bloom a year earlier by pushing it along harder. The flowers are very nice. The plant seems to require no special care, and was smaller when it bloomed for the first time than were V. lanata, V. pendula, and V. calcarata at their first flowering. 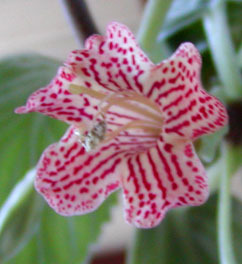 The plant which bore the flower at the top of the page was killed by the freeze of January 2007, when temperatures fell to around 28 F [-2 C] or lower five nights in a row. Fortunately, I had an indoor plant as backup. 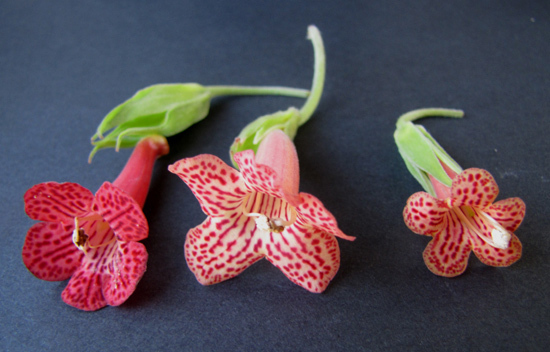 This picture shows flowers from three different plants of Vanhouttea brueggeri. The one in the center is largest but palest, while the one on the left has the most intense color. Unfortunately, that plant was killed by cold in the winter of 2012-13. This plant was heavily damaged during the winter of 2012-2013, when temperatures in my back yard reached 27 F [-2.5 C]. The plant completely defoliated. In addition, most of the stems died, as can be seen in the picture. In the spring, however, new shoots came up from the base of the plant. 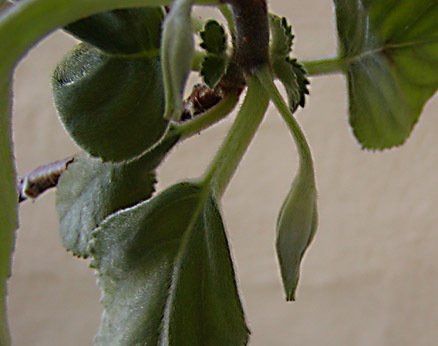 We note from this picture that V. brueggeri does not belong to the free-calyx-lobes vanhoutteas, since, as in V. lanata, the valvate sepals (calyx lobes) are joined to enclose the developing flowerbud. In the Chautems paper cited above, he mentions the "calyx with keeled sutures at base". In this picture, we can see these ridges between the calyx lobes of the flowerbud. Such ridges are particularly prominent on the flowerbuds of Paliavana tenuiflora. As for the "sutures", see the Geek Detail below. This picture shows two seedlings of V. brueggeri. The one on the left has the opposite leaves typical of the species. The one on the right has whorled leaves (three per node). 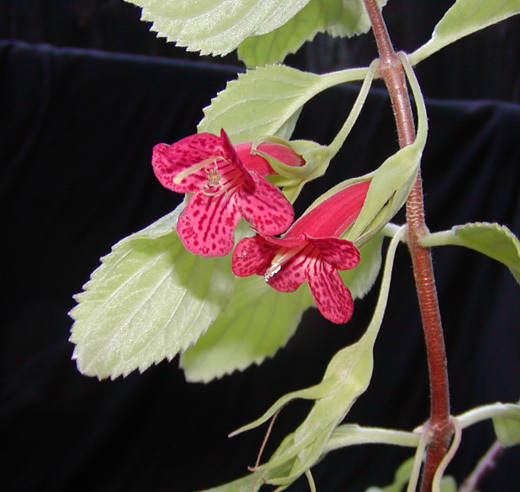 A list shows the other sinningia-tribe species which usually or sometimes exhibit whorled leaves, but none of the others are in the Sinningia clade that includes V. brueggeri. In this species, at least, the whorled leaves are probably a developmental quirk, and not an inheritable trait. 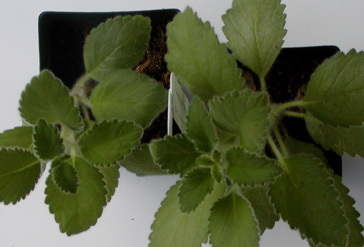 The parent of the seedling on the right had normal two-per-node leaves. On the other hand, it is not a result of unnatural conditions in cultivation either. 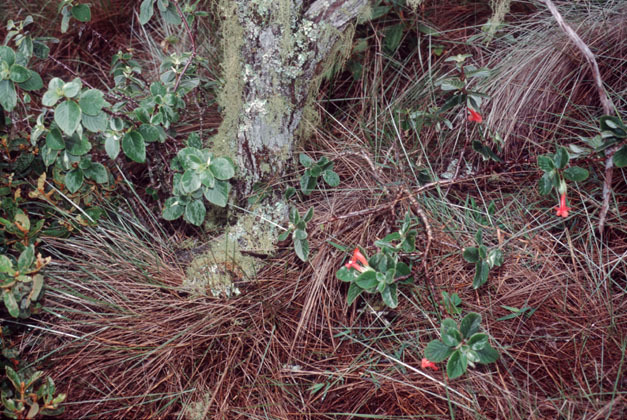 The picture (below) of V. brueggeri in habitat shows one stem (bottom right) having whorled leaves. We have a page showing a comparison of the leaves of four vanhouttea species. This picture, kindly provided by Alain Chautems, shows how V. brueggeri grows in the wild. It shows that the species is not a heavy bloomer, having just a few flowers per stem. The most interesting feature is that the stems are growing through and under grass, poking through the grass in a few places. 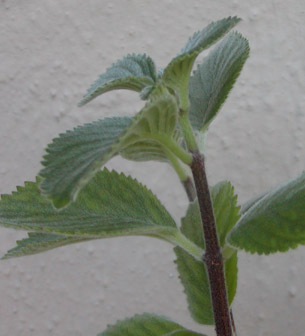 This could explain the tendency of this species (and the related V. lanata) toward bare stems with a tuft of leaves at the top, since the stems appear to be prostrate and overgrown by other plants. The DNA data suggest that Sinningia hirsuta is not too far from V. brueggeri, so one year I put pollen from S. hirsuta onto V. brueggeri. I got one plant. This sparsity of seed and germination is usually a sign that it is not a selfing (my usual result from adventurous crossings). Even so, when it eventually bloomed, it turned out to be V. brueggeri and not a hybrid at all. 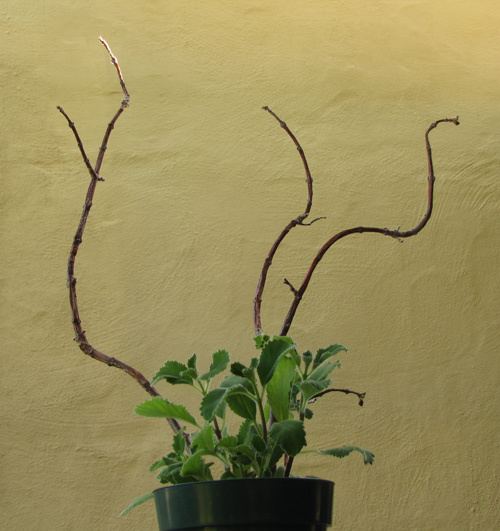 My plant of S. hirsuta is long since dead, so I can't repeat the cross. There are other hybridization candidates, such as V. lanata, another hairy species. I'd cross V. brueggeri with V. calcarata, which has nice foliage, but it's hard to do hybridization with foliage. This thing, that looks like a vegetable jellyfish with stinging tentacles, is a developing fruit of V. brueggeri. 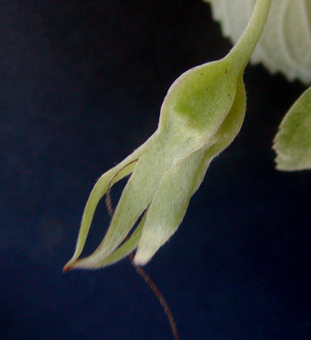 The sepals, the individual lobes of the calyx, hang downward to the left. Above that, we can see the "keels" on the calyx which were mentioned earlier, in regard to the developing flowerbud. GEEK DETAIL #1: This picture shows that the keels are lined up with the divisions (sutures) between the sepals. It is especially clear for the keel facing (mostly) front, which points almost directly at the junction between two calyx lobes (sepals). GEEK DETAIL #2: This arrangement of perianth (calyx + corolla) and ovary presents a little problem for the traditional distinction between superior and inferior ovaries. Superior ovaries are those where the ovary and its descendant fruit are situated above the point where the perianth meets the pedicel (think Streptocarpus). Inferior ovaries are those where the ovary and its descendant the fruit are situated below (or in back of) the point where the perianth meets the pedicel (think of the female flower of a squash or cucumber, where the ovary -- looking like a miniature fruit -- sits in back of the yellow flower, as a kind of swelling in the flowerstalk). The ovary and fruit of Vanhouttea brueggeri are situated behind the point where the corolla meets the pedicel but in front of the point where the calyx meets the pedicel. The new non-judgmental Latinate vocabulary has a word for that: perigynous. This is -- no sarcasm here, folks, none at all -- way better than the terms superior (in most cases, primitive) and inferior (in most cases, advanced), which referred to position but seemed to express an opinion. Made-up words can sometimes be a big improvement. Inflorescence Axillary cyme, usually one flower per axil, in nodes near the end of the shoot. Light Blooms best with lots of sunshine. Hardiness This species is not harmed by 32 F [0 C]. At temperatures around 29 F [-1.5 C], most foliage will be killed, but stems will usually survive, to sprout new growth in the spring. At 27 F [-2.5 C], plants not protected in some way from the cold will be killed. Just a little bit of protection will help plants survive mid-20s temperatures. Propagation For me, cuttings root slowly if at all. Seeds are slower but more reliable. Recommended? Definitely. Nice flowers, on a smaller vanhouttea. Taxonomic group In a vanhouttea subgroup of the Sinningia clade. Habitat Uplands in Minas Gerais state, just north of the border with Rio de Janeiro state, Brazil. Not far from locality of V. hilariana.